Perhaps it’s the popularity of the Broadway show “Hamilton,” or whispers from the spirits slipping unseen through our 1780’s house. Or… maybe it’s my despair at the frailty of the Constitution’s checks and balances in fending off the maelstrom of policies of an administration of aging white men unconcerned about the morale of the country or the health of the planet. Yeah. That might be it. Whatever the causes, lately I have fled to history and the refuge of events resolved. Washington, Jefferson, Hamilton, and Lincoln have been my between-the-pages companions. 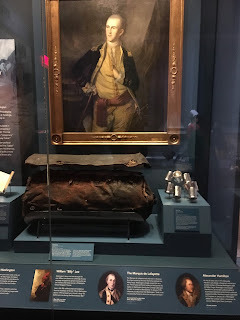 So, when I learned that a Museum of the American Revolution had opened in Philadelphia, I was eager to visit. While home with my mother, I asked if she’d be willing to check it out with me. Trudging brightly lighted galleries flanked with glass cases can tire anyone, and I know Mom’s not a fan of lengthy excursions, but she must have detected the plea in my voice, and trooper that she is, she agreed. But this was a trade-off: a morning hike through the museum for my mom, and Lea as chauffeur through the narrow streets of Philadelphia. Both WAZE and MOM were my guides. We wanted to beat the tourist crowds at the museum and so, headed in just after rush hour. The Schuylkill Expressway is a beautiful route along the river, but traffic-wise, it is no treat no matter the time. I programmed the GPS to help us once we needed it, but we took back roads for as long as possible. Unaware of our plan, the WAZE lady with her calm, authoritative British voice tried to convince us to take the Expressway… and Mom contradicted her every direction. “Go left,” said the WAZE lady. “Go left,” urged the WAZE lady. I felt like an eager, over-anxious schoolgirl perched well forward in my seat, both hands gripping the wheel, posture erect, hoping to please everyone, but given those competing commands, unable to. Once we reached “town,” as my parents call Philadelphia, we gave WAZE lady the lead. I thought I discerned a smug satisfaction in her tone as she led us unerringly to a parking lot a block from the museum. “You have reached your destination!” she announced. With the help of my two guides, I safely delivered us to the heart of early America, so my burden was lifted. Mom’s museum march still lay ahead. We walked down a lane flanked by centuries-old brick buildings. I noted an inviting tavern and filed it away as a future possibility. Several blocks ahead, I spied Independence Hall and, having not crossed its threshold since a field trip in fifth grade, felt a tug of yearning. That stop, and the tavern, would have to wait. Acquiring our entrance tickets had been another minor challenge. For years, I had taken pride in being one of the last people on the planet to carry a flip phone and gave in only when my grandson was born. With its text, phone, GPS, and photo components, my iPhone has opened a new world. I had no need for its other fancy capabilities, thank you very much, until it was suggested that museum tickets be purchased in advance. The day before our visit, therefore, I called Dave in Connecticut and he talked me through the process using Safari and Google. Neophyte that I was, I was wary, and as it turned out, rightly so. While the Viator ticket site assured me, “Your booking is paid for and confirmed,” no voucher appeared when I tapped “View Voucher,” nor when I checked my emails. After several convivial chats with Ella at the museum, Tamara at Visa, and Sarah at Viator, I was assured two tickets would be waiting for us at the will-call desk. And Alleluia, they were. Another potential problem overcome. “I know, but this will be fine.” At 85, few things daunt my silver-haired mother, and when they do, she’s determined to best the circumstances. She took hold of the bannister and, resolute, climbed right up. I loved the museum. Open only a month, the exhibits were a mix of traditional glass cases, three-dimensional vignettes, and interactive digital screens. I could imagine the excited volley of ideas in the brainstorming sessions that led to an entire room dominated by a full-size privateer ship, available for bow to stern clambering; a movie immersion in the Battle of Brandywine where smoke and the smell of sulfur filtered into the room as we “charged” through tall grasses with a battalion; wall-sized time-lines on which the touch of a finger to an event or document generated a blow-up and history of that item; and two real stuffed horses, mounted by British dragoons, frozen in their race. Dramatic as it was, several visitors wondered aloud how those horses died. A nice lady assured us that the horses lived a full life on a lovely farm and died a natural death. Mom and I would have liked to know their names. Slavery, the “peculiar institution” that Lincoln abolished and that troubled our Founding Fathers’ consciences (clearly, not enough) was highlighted throughout, more than I expected given the usual coverage of the Revolutionary period. 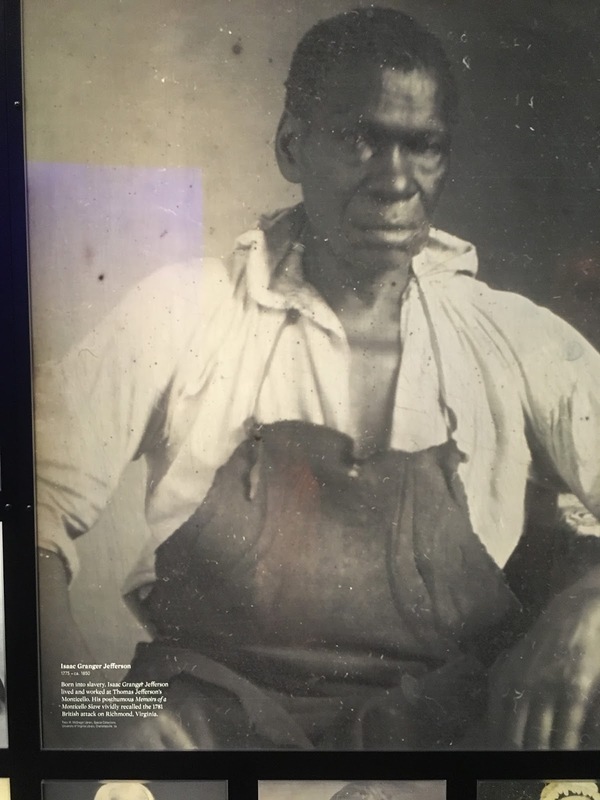 The historians who planned this museum wished visitors to contemplate the enigma of those who fought for their own equality and unalienable rights while holding others’ enslaved. One of the interactive screens provided images of a number of historic people and events and asked viewers to consider “What would you do?” In one case, Eve, a slave for the wealthy Randolph family of Williamsburg, feared her son George would be sold, so mother and son fled to the British lines in search of the freedom they promised. They arrived to find the British camp infested with smallpox. Eve was confronted with a terrible choice: stay and chance disease, or return to the Randolphs where punishment, enslavement, and the possible sale of her boy awaited. In a flash, the screen told me my choice matched Eve’s. But the British lost the Battle of Yorktown… and Eve was returned to slavery. Several years ago, the Fairfield Museum hosted a traveling exhibit about Abraham Lincoln. A pen used by the Great Emancipator to sign the document that freed the slaves was in a lighted glass case, low to the ground. In awe, I sank tearfully to my knees – again, the case was low, but still, the actual pen once held by that extraordinary man and employed to such purpose? Praise God and thank you, Mr. Lincoln. I respect General Washington, and enjoyed seeing his blue sash, leather duffle, and war tent, but Lincoln holds my heart. In 1776, Thomas Jefferson wrote of equality, rights, liberty, and the pursuit of happiness while owning his fellow humans. Just shy of 100 years later, Lincoln took a step toward upholding those assertions. To this day, we falter in living them. The Revolution is behind us, its principles touted and enshrined, but abroad and at home, Americans continue to fight. Peace, respect, tolerance, and compassion are sacrificed because of distrust… oh, and for oil, money, and power. I ache at our willingness to kill and be killed for such things. Mom had marched ahead of me, her hike complete, and was waiting on a bench in the hall. 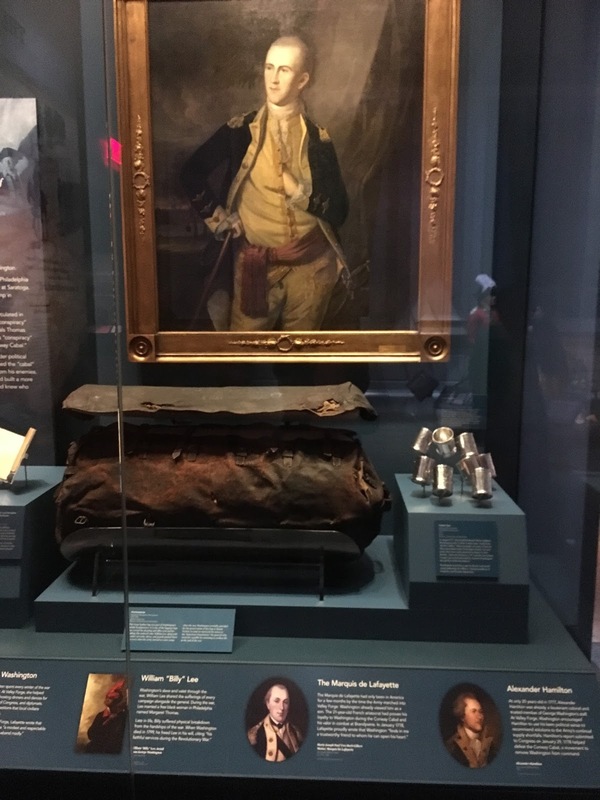 As I exited the final gallery to meet her, I passed through a wall of mirrors with a sweeping sign in large gold letters: MEET THE FUTURE OF THE AMERICAN REVOLUTION. The founders wrote often of their responsibility to posterity; we must give more thought to the generations ahead whose well-being depends so fully on what we do now. Or, what will they have to say of us?